Cards: ProSet 1990, Action Packed Rookies Update 1992, GameDay 1992, Action Packed All Madden Team 1990. *Autograph Fee $5 per card. Keith Jackson was the highest rated tight end off the board in 1988 after a prolific career for the University of Oklahoma. A complete package at the position, Jackson had soft hands, and just about the right size, speed, and blocking ability to handle just about every duty assigned to him. Over his career at Oklahoma he racked up 1407 yards on 62 receptions- a whopping 23.7 yards per catch. He’d earn the appropriate nickname ‘Boomer Sooner’ from his teammates for his penchant to show up in big games, making big plays, leading the Oklahoma Sooners to a National Championship in 1986. During the National Championship game against Penn State, Keith caught a spectacular 71 yard touchdown pass. He was selected in the first round of the 1988 NFL draft by the Philadelphia Eagles. Buddy Ryan, who was head coach of the time eschewed receivers, but loved the all around ability of Jackson and quickly put him to work. It didn’t take long for Keith to become a fan favorite of the Eagles and Randall Cunningham, as he set the team mark for yards by a rookie with 869, to go along with 80 catches, and 6 touchdowns earning Keith his first Pro Bowl and AP nods. In a final accolade that season he won NFC Rookie of the Year Honors. 1988 was his best season statistically, but by no means did it represent the end of his career, as both in 89 and 90, he’d also be named AP and to the Pro Bowl for his solid seasons with 63 and 50 receptions respectively. 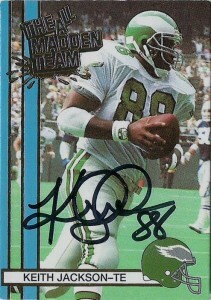 After catching 49 balls his final season with the Eagles in 1991, Keith signed with the Miami Dolphins in 1992. With the dawn of Free Agency and the Dolphins looking to add new weapons for Dan Marino, Keith quickly stepped right into the starting lineup for Miami, staying there for 3 seasons. Along the way Jackson scored 18 touchdowns on 146 receptions. Another ProBowl was in store for him in 1992, with 594 yards and 5 touchdowns. Keith moved on to the Green Bay Packers and became a nice redzone target for quarterback Brett Favre. 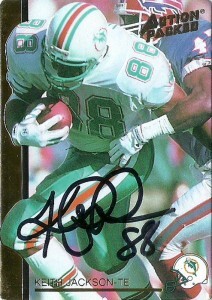 Although his 1995 season was marred by injury, Keith recovered in time for 1996 scoring 10 touchdowns on 40 receptions. This earned Keith his final Pro Bowl nomination and culminated in the team’s victory over the New England Patriots in SuperBowl XXXI. He’d retire after the season. Keith is a player who really hasn’t gotten his due, as he has never been considered for the Hall of Fame. Although the passing game has mutated into what it is today with tight ends that behave like wide receivers, Keith was an anomaly out of time. One surely wonders what sort of damage he would have done if he was playing during the current pass happy era of the NFL. Surely he would have posted some gaudy stats if things were different. Still when you look at the final count, in 9 seasons he was a 6 time Pro Bowler on 3 different teams, and a 3 time All Pro from his 3 seasons in Philadelphia. I had been long interested in adding Keith to my collection- as far back as 2009, but kept kicking the can down the road on this one. Wish I had sent out for this one sooner as it was a lighting fast reply c/o his charity P.A.R.K. He does color commentary on the radio currently for the Razorbacks, and was inducted into the College Football Hall of Fame in 2001. I really liked all these cards. Pro Set actually liked the 1990 card they produced so much that they used it frequently for promotion. I can see why with the way the light perfectly hits Keith’s pads, lighting up the green in contrast to the black background. It provides quite a silhouette. I was never really a fan of the ‘All Madden Team’ Action Packed cards that were produced, although this shot in particular is a good one. The GameDay 1992 cards were superior and unique cards, and along with the Action Packed, made great cards to get autographed due to their look.